The war in Bosnia has been relaunched with a vengeance. There were widespread hopes this spring that negotiated deals could lead to a permanent end to fighting. But the prospects of peace were shattered by a series of events which may yet launch the war on its most dangerous phase. The latest crisis was sparked in May as the contending sides faced the choice of extending a three month ceasefire, or starting new military offensives. Muslim and Croat forces tried to seize back land taken by the Serbs at the start of the war. 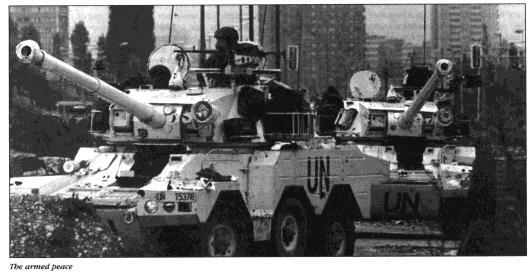 The Serbs responded by moving heavy weapons back into areas from which they were excluded by UN rules. On 25 and 26 May Nato jets attacked Serb positions. What followed showed the folly of and the limits to Western intervention, as 300 UN soldiers were taken hostage by the Serbs and about 70 people were killed in Serb bombardments of Muslim 'safe areas' such as Tusla. Then in June the Bosnian government started its most ambitious offensive yet--to drive a wide corridor between Sarajevo and the main bulk of Bosnian held territory. These events have thrown debate about Bosnia once more onto centre stage. The Western leaders are in turmoil over whether to stay (under the guise of the United Nations) to go, or to move in even greater numbers of troops. On the left there are renewed calls from many for the Western powers to stop pussyfooting around and sort out the 'Serb aggressors'. 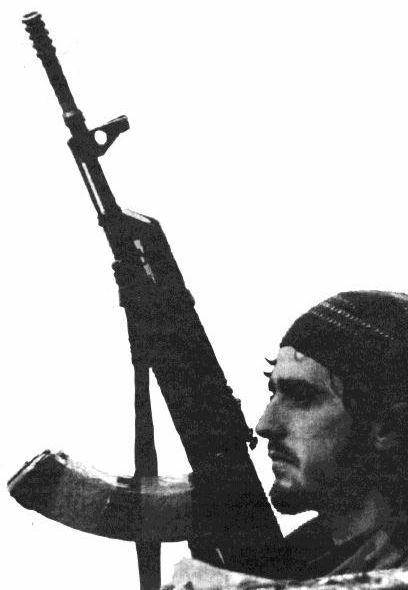 It's time, they say, for the left to clearly take the side of the 'just'--the Bosnians. With fighting in the former Yugoslavia now having lasted as long as the First World War, there is a justifiable feeling of frustration. However, the latest events, far from showing the need for renewed intervention, have shown the folly of supporting either increased Western intervention, or of supporting one side in the conflict. Socialist Review has throughout argued two things about the conflict in the former Yugoslavia. The first is that it is pointless to view the war in terms of 'good' and 'bad' sides. The war in Bosnia was started largely as the result of an agreement struck between Serb leader Slobodan Milosevic and Croat leader Franjo Tudjman that they should carve up the territory between them. Both the Serb and the Croat leaderships whipped up ethnic hatred against others in order to deflect attention from the chronic political and economic crises wracking their countries. Croat forces overrunning Western Slavonia (a traditionally Serbian populated area of Croatia) this spring ejected civilians from their homes just as ruthlessly as Serbian forces have done to others (or as Croat forces have been doing for the last four years). The battle for the former Yugoslavia has therefore been characterised by a cynical battle between ruling groups with two aims in mind: to grab as much territory as possible and, in doing so, to stir ethnic hatred against ordinary people from different backgrounds. This factor would have only a tenth of the impact, were it not for the fact that every nationality can point to wrongs done to its own people, which therefore reinforces grudging identification with rulers who argue that only an ethnically based solution is possible. Many who brand the Serbs as the sole aggressors will now admit, however, that the Croatian leadership has been culpable too. But, they say, the side of the Bosnian Muslims is different. They have been bullied by the major powers of the former Yugoslavia and systematically neglected by the Western powers. Many may feel that the Bosnians have been singled out for persecution as they are Muslims. This can certainly seem a powerful argument in the context of countries like Britain where anti-Muslim bigotry serves as the umbrella of respectable and less respectable racism. Internationally, imperialism seems to have a track record of singling out Muslims. However, the argument doesn't in reality hold water and it is quite wrong to portray the war in Bosnia as the struggle of the oppressed against oppressors. The Muslims of Bosnia were not an oppressed group before the war started. Their occupation of senior positions was largely in proportion to their numbers and they could not be shown to suffer disproportionately on any economic index. Indeed, in cities like Sarajevo, and particularly among the young, identification with a Serb, Croat or Muslim background was considered irrelevant to modern concerns. Since the war started, the official Bosnian leadership has progressively come to mimic those of the Serbs and the Croats. It is true they were the last to be drawn into the conflict, and lasted longer than any others as a multi-ethnic entity (there are still Serbs and Croats in the government). However, the government under Aka Izetbegovic has had to turn to ethnically based solutions in the absence of a class based alternative. By turns, the Bosnian leadership has found itself in alliance with Croatia, accepting Western demands for a solution based on separation, and then, from the end of 1993, combining both these policies with Muslim ethnic chauvinism to carve out the greatest possible slice of territory with offensives in central Bosnia. Izetbegovic has been described by the very sympathetic journalist Ed Vulliamy as 'a man who had embraced the ethnicisation of politics as eagerly as any of his contemporaries'. Even in spring 1992 Izetbegovic has endorsed, with the Croat and Serb leaders, a plan to ethnically partition Bosnia. Only an outcry in Sarajevo forced him to reverse his plan. The Bosnian government was then in alliance with the Croats. Yet this broke down with the first joint victories over the Serb forces. Just as the Serbian seige of Mostar was collapsing in the spring of 1992, Bosnian Serb and Croat leaders met in Graz to divide the country between themselves. Still Izetbegovic clung to his 'alliance' and the key Western diplomats of the time, Cyrus Vance and David Owen, 'endorsed the wilder claims of "Herzeg-Bosnia" [the Croat's planned separate state] ... giving the Croats not only Herzegovina, but country stretching deep into predominantly Muslim central Bosnia.'. By the spring and summer of 1993 the 'alliance' was effectively dead. Now the Bosnian government stood on its own as a third power fighting for territory, and with no strategy other than an appeal to Muslim nationalism. Misha Glenny wrote of the 'increasingly influential radical wing of President Izetbegovic's Party of Democratic Action (SDA) whose base in Zenica north of Sarajevo has become a centre of Muslim nationalism, and, it must be said, intolerance. The Zenica authorities were the first to undertake "cleansing" operations against Croats earlier this year'. He reported Muslim and Croat forces fighting to make real the divisions suggested by Western leaders, characterised by the same horrors as those which had taken place in fighting between Serbs and Croats and Serbs and Muslims. Today the Bosnian government is back in alliance with the same Croat forces which threw 45,000 to 55,000 people out of their homes in Mostar alone. It is hard to see the Bosnian government forces as committed to a multi-ethnic solution merely because they are in league with ruthless ethnic cleansers of a different nationality. There is much talk on the left of 'appeasement' and parallels made between the war and the Spanish Civil War of the 1930s. They say that the procrastination of Western governments is akin to the 'non-intervention' of Britain and France in Spain which allowed fascist Germany and Italy to intervene unhampered on the side of the fascist forces. But this is quite a different kind of war. In Spain the war was fought between, on the one hand, a Republican side of Communists, anarchists and liberals, and on the other hand, a nationalist side led by fascists. Franco aimed to annihilate working class organisation, the Republicans fought to improve workers' conditions and, in the case of many anarchists and socialists, for the overthrow of capitalism. How far this is from Bosnia where all sides--no matter what their differences in military strength or records of atrocities--are fighting for the control of territories in which the status quo will remain. Of course there are minor differences to be discerned, but the key questions that could make one side more progressive--such as even the promise of trade union rights or improved living standards--are on no leader's agenda. Some people say, even if Izetbegovic is to be criticised, surely we can best do that while supporting the 'authentic' voice of Bosnian internationalism? The trouble is that this hardly exists and where it does it comes under fire from the official leadership in Sarajevo. The aims of the Bosnian leadership are objectively the same as the Serbian or Croat leaderships, and support for the Bosnian side in no sense promotes class struggle. Instead it just involves the left in the quagmire of ethnic divisions without pointing the way forward. This leads to the second thing Socialist Review has consistently argued for--that the leaders of the major outside powers can provide no solution. We argued that the failure firstly of Russian style 'state capitalism' and then of Western style market capitalism lay at the root of economic collapse and political despair. The Western rulers have shown throughout that they can at best mirror the rotten policies of ex-Yugoslavia's own rulers. At worst, they can reproduce the tragedy on a higher and more terrible scale. Hence round after round of proposed settlements--all of which have involved the division of the country on ethnic grounds. This is what lies at the heart of the West's dilemma. The hostage crisis and the June offensive threw Western leaders into new levels of turmoil. President Clinton first talked tough with hints of US ground troops being made available. This position was quickly reversed, however, and both the US and France settled for tough posturing about the possibility of heavier air attacks. The British government, meanwhile, merely despaired that its planned withdrawal of troops would have to be reversed, in the short term at least. The Western policy in Bosnia is slowly swinging round. The US in particular has pursued a twin track. On the one hand it has tried to sever the links between the leadership of the Serbian state and its acolytes leading the fighting in Bosnia. This spring Milosevic promised to recognise the borders of Bosnia in return for a lifting of Western sanctions against Serbia. On the other hand, the US in particular is moving to fulfil its long term goal of siding clearly with the Bosnian government. The more far sighted of US leaders, as well as 'isolationist' right wingers, are wary of this strategy, however, and talk in terms of crossing the 'Mogadishu line'--a reference to the disaster of the US fighting on one side of the civil war in Somalia. Yet talk has resumed of lifting the arms boycott to the Bosnian government. This, plus the posturing which surrounded the hostage crisis, must surely be one of the factors behind the decision by Croat and Muslim forces to launch the June offensive. Even without an official lifting of the arms embargo, the Bosnian government hardly stands alone. Some of the most reactionary states in the world, including the Middle Eastern oil sheikhdoms, have provided arms. There are almost certainly arms covertly arriving in Bosnia from US sources. Now, at the very least, Clinton envisages a strategy of combining arms shipments to the Bosnian government, while providing air cover for offensives. Increased arms aid to a force already powerful beyond the rhetoric about 'poor little Bosnia' could make for a major difference on the ground. 'Even modest levels of targeted support from the West could significantly shift the balance of forces in Bosnia, without involvement of foreign ground troops', according to a director of the US Institute of Peace. Others in the US ruling class have an interesting variant on this theme and talk of the need for the return of the 'Reagan Doctrine': using covert means to secure the aims of US power. Right wing chairman of the foreign relations committee Jesse Helms said the UN should 'begin treating the Bosnians as we did the [Nicaraguan] Contras'. Westem leaders have spent four years warning each other about the dangers of getting stuck in a quagmire. They are now stuck in one without even the option of a simple withdrawal. The present level of Western intervention has been capable of no more than sanctioning the repeated carveup of Bosnia. Increased levels of military, involvement can only make matters worse by destabilising the whole region and drawing Western forces into a direct battle with the Serbs in particular. The Western leaders' strategy in Bosnia has had terrible results. They sought to 'contain' the crisis and have succeeded in helping it rage on for four years. Those on the left who call for a taking of sides are stuck too. By turning their backs on what can unite ordinary people of all ethnic backgrounds--a class hatred of their leaders--they have had to side in despair with people following the very policies they despise. There is an alternative however, and it lies with all those people who have lost the most from the war. Workers in Belgrade and Zagreb (and Sarajevo too) have had their living standards and political freedom dashed by a war that has been fought to save the necks of those responsible for their misery. It's not a pipe dream to hope that these resentments can turn into class struggle--they already have done in every year of the war. Even on the rural front lines, where the day to day demands of war are more immediate and there are fewer traditions of class struggle, new antagonisms threaten to undermine the militarists. If such soldiers learned that ordinary Muslims hate their own leaders too, and the US air force which rains bombs on them, the trance of mutual fear could be broken. Those on the left who talk solely of the 'Serbian menace', however, are doing their bit to stop this coming true.